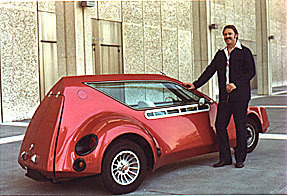 The Vigillante is a third generation design of a vehicle originally developed in 1974. 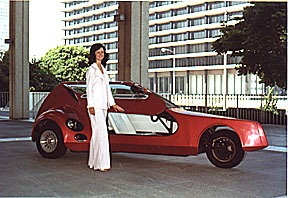 The first generation design was called the TriVette, developed specifically as a response to the first Arab Oil Embargo in late 1973. During this Arab Oil Embargo it became clear that we needed to take a fresh look at basic transportation in this country. We had become very fat and careless in the design of our basic transportation vehicles. A study by an auto club at that time found that 93% of the vehicles on the freeways in Southern California were being driven with only a single occupant, the driver. It is extremely inefficient, both in terms of the resources required to manufacture these vehicles, as well as the fuel required to drive them, to use a 3,500 pound vehicle to carry a 180 pound payload. In fact, it is absurd. We did a systems analysis of the various alternatives that could be used to address this issue. We looked at 4-wheel, 3-wheel, and 2-wheel configurations. This analysis led to the selection of a 3-wheel, single front tire configuration as the optimum choice. This choice offers opportunities for very light weight, excellent aerodynamics, excellent handling and performance, and modest costs. 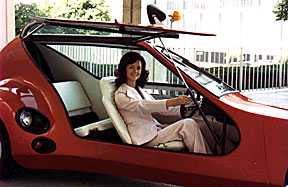 The TriVette was designed as a vehicle that was optimized to comfortably carry only the driver most of the time, in a fully enclosed, all weather vehicle with heater and optional air conditioning. That is exactly what is needed to create a fuel-efficient commuter vehicle. A second seat is provided for the occasional passenger, or as a place for luggage, groceries, etc. The TriVette is classified as a motorcycle under State and Federal laws. We were licensed by the State of California as a motorcycle manufacturer, and the TriVettes were manufactured in Ventura, California on a custom order basis from 1974 through 1978. The TriVettes met all applicable State and Federal motorcycle standards as of the time of manufacture. 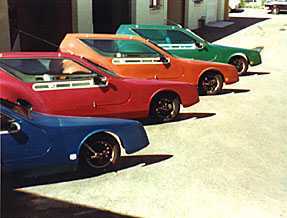 Most of the TriVettes used powertrains and other components from the Fiat 850's of the late 1960's/early 1970's. These were excellent powertrains that provided spirited performance and extremely good fuel economy in a 1,140 pound vehicle. We typically got 50 mpg in heavy city traffic and 65 mpg on the freeway. Also, because of the ir light weight and excellent balance, they were a lot of fun to drive. 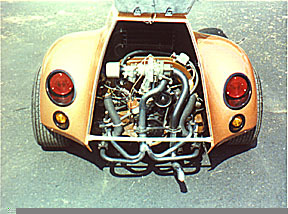 Road Test magazine tested a TriVette and published an article in the January, 1976 issue. Their numbers show that the TriVette reached .77 lateral "g" on the skidpad using Goodrich T/A street tires. Comparison with other vehicles in the review chart attached to the article shows that the TriVette actually outcornered a Corvette of that time by 10%! It also outcornered an Alfa Romeo Alfetta GT, a BMW 530i, a Fiat X1/9, a Lotus Elite, and a Porsche 911S--pretty spectacular handling for a 3-wheeled vehicle, which many people consider to be inherently unstable. Later testing by the Department of Transportation in 1980 determined that the TriVette had a theoretical tip-over limit of 1.28 lateral "g", or a .5 lateral "g" safety margin over what the tires could deliver. That means the TriVette will slide long before it reaches the tip-over limit. It also had the quickest transient response that they had tested. Many previous 3-wheel vehicle designs have typically been oriented toward very low performance applications. 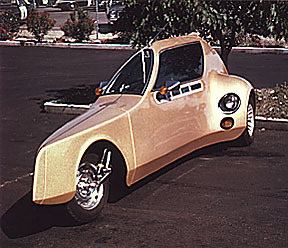 Their physics were not suitable for high performance applications, but the TriVette demonstrated that with the proper physics, 3-wheeled vehicles can be designed to have excelle nt handling. This is also what made them so quick and agile and fun to drive in traffic. Also, the aerodynamics generated large down forces, so the stability increased as the speeds increased. The physics of high performance 3-wheeled vehicles requires that the center of gravity needs to be close to the two tires that can handle transverse cornering loads. The height of the center of gravity must also be kept low to control transverse weight transfer during cornering, as well as fore/aft weight transfer during acceleration and braking. The physics is similar to the careful weight and balance calculations that must be used when designing light aircraft. Also, like in light aircraft design, the highly variable loads of fuel and a passenger must be located close to the center of gravity so they will have minimal effect on the handling as those loads vary. The primary reasons for selecting the single front tire, two rear tire configuration for the TriVette (vs. the single rear, two front tire configuration) are improved performance and handling. During maximum a cceleration, weight is transferred off the front tire and on to the rear drive tires. That increases the percentage of the total vehicle weight on the drive tires, and increases the maximum acceleration capability. The Turbo TriVettes had enought thrust that they could momentarily jerk the front tire off the ground, but careful weight and balance calculations ensured that it could not be held off the ground. Sufficient weight remained on the front tire to provide steering control during maximum acceleration. This provides nearly the acceleration capability of an all-wheel drive design, but without the cost, complexity, power consumption, and weight of all-wheel drive. During maximum braking, weight is transferred from the rear tires to the front tire. At maximum braking, the TriVet te ends up with approximately 1/3 of the weight on each tire. Again, the heigth of the center of gravity, the fore/aft location of the center of gravity, the wheelbase, and other factors are carefully calculated to achieve this result. Even in a full lockup stop on wet or slick pavement in a corner, the TriVette will not spin. That's because more than half of the braking is still being done by the rear tires behind the center of gravity, so the vehicle is in a dynamically stable position. 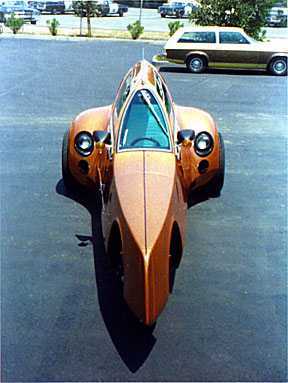 The TriVette will outbrake even high performance conventional vehicles, particularly on slick surfaces. This design also allows a very light static loading on the single front tire, so a very quick 12 to 1 ratio can be used without power steering--again, saving cost, complexity, power consumption and weight. The forces are so light that it can be turned easily with a small steering wheel at rest for parking and requires only two fingers to steer on the freeway. This design also makes possible a front suspension design that has no bump steer, and one which can turn sharply enough to provide a very small turning circles with a long wheel base. The long wheel base provides an excellent ride for the driver, who sits in the middle of the wheelbase. It also provides excellent high speed stability. The long wheelbase does not cost anything in transient response, however, because of the very low mass on the front end and the very quick steering ratio. In fact, the front tire literally goes wherever you point it, even at the limit of adhesion on a skidpad. The transient response of the front end is so quick that it is easy, even for a novice, to stay ahead of the back end where most of the mass is concentrated. 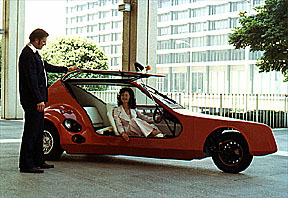 The physics of the TriVette design result in a very stable, quick and nimble handling vehicle. With this kind of handling, it was not surprising that customers began ordering TriVettes with stronger motors. We produced some Turbo TriVettes with approximately 220 horsepower turbo motors. The weight was still 1,140 pounds. This results in a street legal vehicle with 5.2 pounds per horsepower, or about 1/2 of that for a Corvette or other high-performance street vehicle. These vehicles would run 0 to 60 mph in 3.5 seconds and would run the 1/4 mile in 10.4 seconds at 140 mph. Stability and directional control at 140 mph was phenomenal. The Turbo TriVette got the attention of the California Highway Patrol office located next to our facility in Ventura, California. They were looking for a high-speed pursuit vehicle that they could use to quickly run down the kids in their hot Camaros and Mustangs. The shorter the chase, the less the public is endangered. Their smoged Dodge Diplomats with a light bar were limited to 105 mph, and their motorcycles were also limited to 105 mph due to a problem with high speed wobble. This led to a design study funded by a grant from the National Science Foundation for a high-speed pursuit vehicle that would be able to reach 160 to 165 mph. This design was the second generation design. A brochure titled "Specification - Municipal Personal Transit Vehicle" was published from this study.